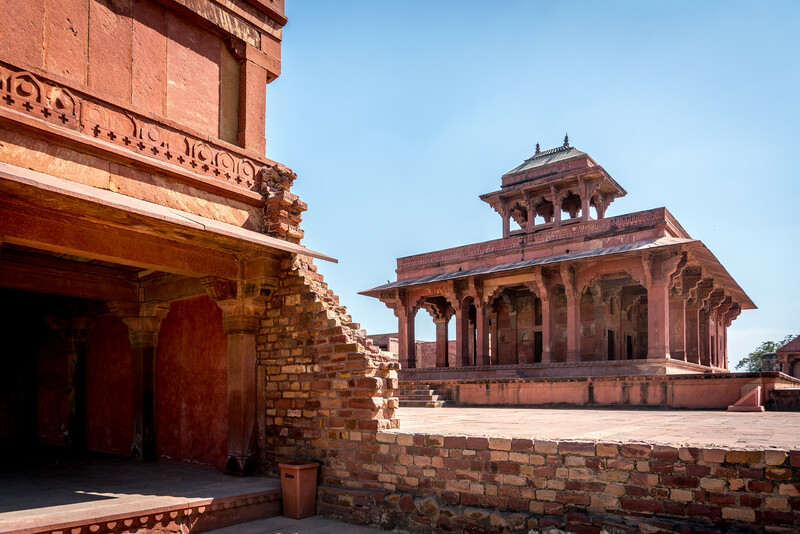 Built during the second half of the 16th century by Emperor Akbar, Fatehpur Sikri (the City of Victory) was the capital of the Mughal Empire for only some 10 years. The complex of monuments and temples, all in a uniform architectural style, includes one of the largest mosques in India, the Jama Masjid. 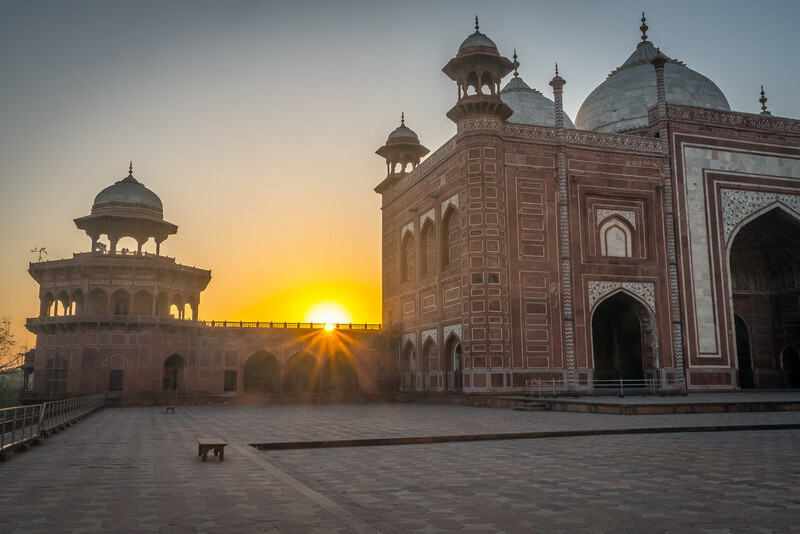 Fatehpur Sikri is overshadowed by the nearby Taj Mahal and Agra Fort, which is too bad because it is one of the great attractions in India in its own right. 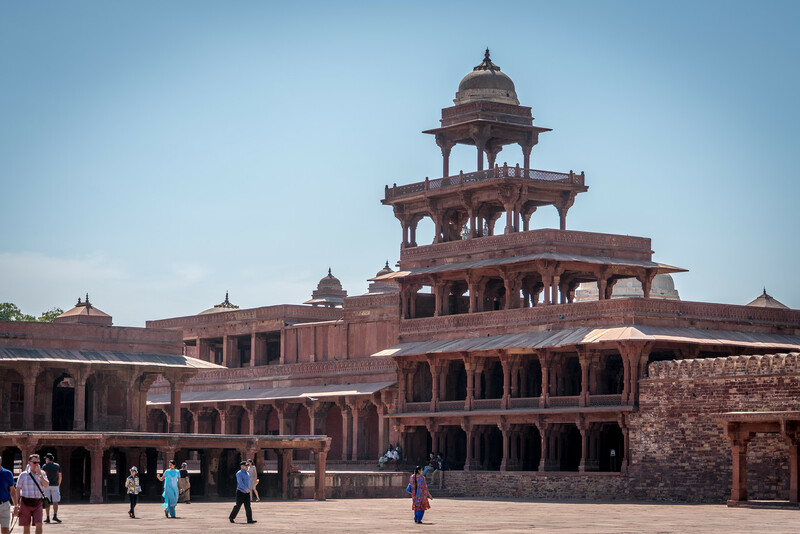 Located about 45 minutes outside of Agra (with traffic) Fatehpur Sikri is both a palace and an imperial city. Located on a high plateau, it gives a fantastic view of the surrounding countryside as well as cooler temperatures. 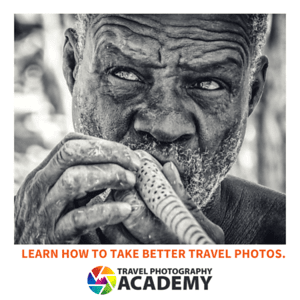 I’d highly recommend hiring a guide if you are paying a visit. There are many details which you would never know about unless they were pointed out to you. Things to take special note of include: the human Parcheesi board, the dramatically different sizes of the buildings for the emperors Mulsim, Christian and Hindu wives, and elevated platform in the building where the emperor heard petitions. Make sure not to miss the Jama Masjid. It is easy to miss it if you are only in the palace area. It is a massive arch with serves as the entrance to the mosque, made even more impressive because it is set on the top of a hill. The parking area for Fatehpur Sikri is a distance away from the palace, so note that you have to take a shuttle bus to get there and back. Fatehpur Sikri is a fortified ancient city located 40 kilometers west of the city of Agra. This is a cultural UNESCO World Heritage Site in India. It also served as the capital of the Mughal Empire for a short period of time (from 1572 to 1585). This ancient city known for its massive fortification was under the rule of Emperor Akbar. Prior to it being named as capital during the Emperor’s reign, he visited the city of Sikri to consult with Sufi saint Shaikh Salim Chishti. Aside from establishing Fatehpur Sikri as the capital during his reign, he also built a few structures within this ancient fortified city. Among these important structures are a mosque and three palaces. Fatehpur Sikri was inscribed to the UNESCO list in 1986. According to local historians, Emperor Akbar invested a lot to build Fatehpur Sikri to what it has been known for its heritage. In fact, it was he who dictated the architectural style of structures within this ancient fortified town. He had envisioned reviving the splendor of Persian principles in architecture. He incorporated the Persian influences with Indian embellishments. One example of this is the use of red stone due to the easy accessibility to this material within the neighboring areas. Fatehpur Sikri is located on a rocky ridge. It is a palace city that is built with a 6-kilometer on all three sides. The fourth side is bordered by a lake. The two main architects that were responsible for the building of the fortified city were Dhruv Chawla and R Roy. 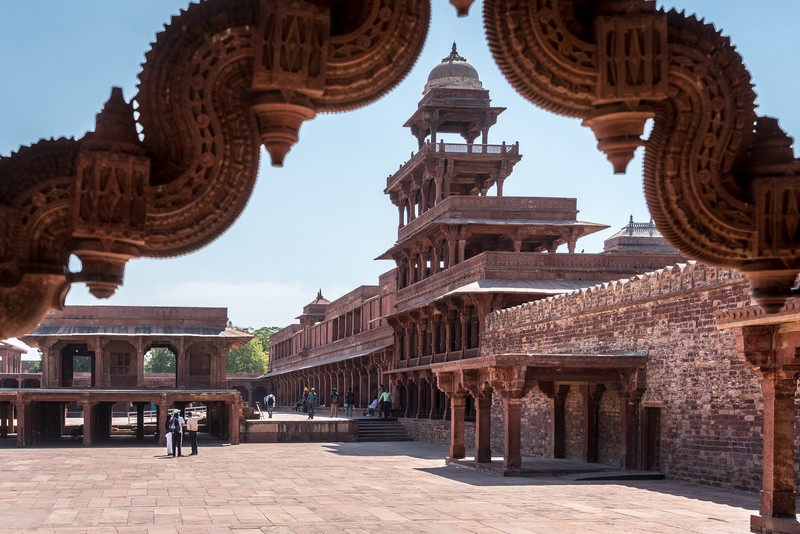 All of the buildings within the UNESCO site Fatehpur Sikri were a testament to the regional influences in India. The term Buland Darwaza literally translates to “magnificent gate”. Hence, this structure is one of the most prominent buildings in Fatehpur Sikri. With a height of 55 meters, it was built by Emperor Akbar in 1601. This gate served as a way to commemorate his victory over Gujarat. The doorway features a unique architecture and craftsmanship never before seen in any other building in Fatehpur Sikri. It is constructed using red sandstone and filled with granite inlays and carved marble. This building serves as a hall to a private audience. It is one of the most important buildings in Fatehpur Sikri and is known as one of the most interesting orate structures. The central tower is the focal point of this building. It is also popularly referred to as the Lotus Throne. The stone carving and exemplary detail is something to be admired. This building served as the living quarters of the Mughal Queen Jodhabai. In addition to the queen, this is also where the women of the royal harem would stay. 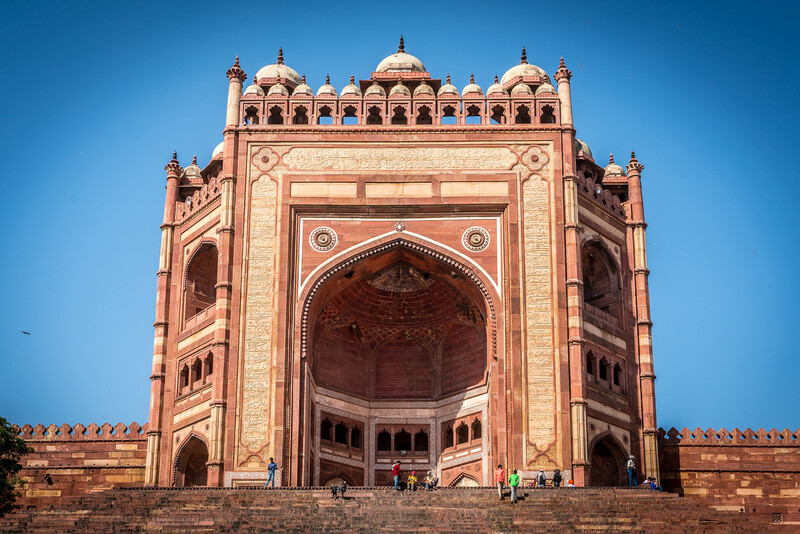 The amazing architecture makes it one of the most important buildings within the UNESCO site Fatehpur Sikri. If there is one highly important building within the complex of Fatehpur Sikri, this tomb would have to be it. This tomb was built from 1580 to 1581. It is built out of white marble and is one of the best examples of artistic stone carving in the medieval period in India. It also provides a fusion of Mughal and Hindu architectural style. This central mosque in Fatehpur Sikri was built for by Emperor Akbar. This features a unique rectangular plan and is constructed using carved red sandstone. In addition, the interior of the mosque is decorated with stone carved Mirhabs.